This third installment of the Discover a Guitarist series is a guest post from Dave Jacoby of Sans Direction. First, there was bluegrass. I got exposed to bluegrass in college around 1992, hearing the Seldom Scene album Live at the Cellar Door. Coming from a musical background of metal and alt rock, here was a music that was all about fun, not in a shallow party-rock way, but clearly musicians playing songs and enjoying themselves in the presence of an audience that’s enjoying themselves. It took a while to get into it, but eventually I started catching the names, and because I was a guitar player, I found the guitarist names before the others. Bluegrass mostly has the guitar in the hands of the lead singer, playing rhythm, so the lead players are few and easily findable. Two of the core names are Doc Watson and Tony Rice. This is “I Am a Pilgrim”, recorded years after the heyday of Clarence’s band, the Kentucky Colonels. His brother, Roland White, is playing the mandolin, and playing in a straighter style, like you’d expect most bluegrass players to play. Clarence is a lot more syncopated and bluesier than you’d expect, and he’s not content to just play chords during the other player’s solo, but rather plays licks to egg the current soloist on. This is “Wildwood Flower”, played with two guitars and recorded for woodshedding purposes. This is a prime example of crosspicking, where the melody is carried along in an intense flurry of notes. Thing is, while that should be more than enough, it really wasn’t. The problem is that Dylan went electric, so all the people who thought that playing acoustic guitars was hip started to listen to electric guitars, which made folk and bluegrass bands seem square. So, Clarence White got himself a Telecaster and learned to play electric, eventually becoming a session player. One of the early sessions he played was the Byrds’ album, The Notorious Byrd Brothers. 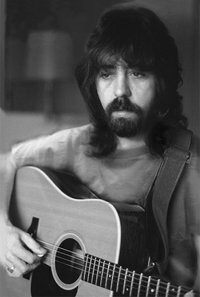 He then was involved with the country rock milestone Sweetheart of the Rodeo, and come Dr. Byrds and Mr. Hyde, he was a member of the band. Largely gone are the harmonies of the Byrds you’re more familiar with, but in their place is an amazing guitar with a trick. His Telecaster was fitted with steel guitar mechanisms, which allowed him to bend his B string up a full step, giving him the ability to take on a lot of the sound of steel guitar. But he wasn’t just a country player. Here’s the first track on Dr. Byrds and Mr. Hyde, where Clarence coaxes his Tele into nasty metal tones on (no surprise) a Dylan song, “This Wheel’s On Fire”. And again, we have a trademark instrument, here is his sunburst Tele with the Parsons-White B-Bender, passed on to another player while still being considered as belonging to Clarence. This song, Marty Stuart’s “Hummingbyrd”, was written to be a tribute to CW, taking on the style of his trademark tune, “Nashville West”. It isn’t common for one player to be so foundational in multiple styles. I’ve never been one to want to take on another player’s solos note-for-note, but the first one I did was CW’s break on “Red Rocking Chair” from the Muleskinner album. This recording took place after the breakup of the Byrds. Muleskinner was made up of a number of bluegrass players from the early 60s who went to rock music in the late 60s, and there’s not a bad player among them, but Clarence is the one who widely varied from the written melody. His break is about at the 2 minute mark, and the thing that most drew me was how he used the E on the B string against the open E. They’re supposed to be the same note, but they were not the same note, different enough that I was driven to transcribe to figure out the “magic”. Clarence, more than any other, inspired me to break from my core blues-based playing, to believe that any style can be placed into a seemingly-antithetical musical context and be made to work. It also opened my ears to Bakersfield country, the ’60s-era version of country from players like Buck Owens. For specific playing changes, I have started to use more precise steel-type bends to contrast the more emotive blues-type bends. Already a fan? Leave a comment below and tell us how you discovered CW’s playing and what it’s done to you. 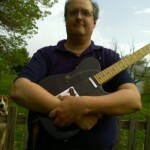 Dave Jacoby blogs at Sans Direction, where he goes on about music and guitars and Telecasters and not sucking. He lives somewhere between Chicago and Indianapolis, mining bits for money. Photo of Dave by Niel Jacoby.